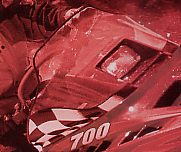 If you have any type of snowmobile from the latest the industry has to offer to a vintage restoration machine, we have a headlight and taillight to improve your riding experience. Our industry leading Xenon Gas Brite Lite brand of headlight bulbs are the number one name in the snowmobile market and for good reason- we are true snowmobilers and test every product we sell on the real thing- SNOW!! We log miles every year like any other snow junkie, chasing the last snowfall, taking in a race, and driving out to the mountains to get it steep and deep! With our travels, we have developed the largest line of lighting for your needs no matter what keeps you from your full potential. we have Brite Lites that improve near field problems like snow dust and fog, we have Brite Lites that can double your Hi-beam length and width by using the state of the art Xenon Gas Blues like the European and luxury cars with HID lighting. We have multi color bulbs to help with both types of driving conditions, and anything in between. Look for your machine type below or use our advanced bulb picker database to help if you are unsure of the chassis or the best bulb for you. If you are interested in purchasing on line, just click on "MORE INFO" on the desired product below and use our secure shopping cart to make your purchase fast & efficient! All new for 2016 - Fanless technology. LED replacement headlights! 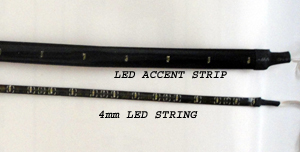 Available for all snowmobile applications and converts the stock bulb to a true LED headlight. Hi-Lo beam (LED Chip on each side) function is the same, draws less power, solid state and long life. Full 2 year warranty on all kits. Plug-n-play. We have both DC and AC kits for the any new and old snowmobiles. Several options, so look at the description to help, or call to be sure. All kits are currently configured for a twin headlight bulb machine(replaces both bulbs to LED). If you have an older single headlight bulb machine, a special kit can be made for your sled. Please call. This is the largest part of the snowmobile market as ALL current production Polaris, Ski Doo, and Yamaha snowmobiles use a twin headlight configuration in ALL of their chassis offerings, new for 2012 Arctic Cat now does in all performance models as well). Weither the headlight is one sealed unit, like the Polaris IQ, Edge or Ski Doo REV, XP, ZX, or a split unit like the Yamaha's, they ALL use a pair of our durable Brite Lites H4 type of headlight bulbs. H4, or a P43t base (3-prong) headlights are available in several colors, wattages, and we have one that is right for you and your needs. (2011+ Polaris RUSH/PRO us H13 plastic base) All the newer (in the last 10 years) twin headlight machines have plenty of charging system to handle the extra wattage and all are safe for wiring and heat resistanse without reducing the hand warmer effectiveness. Be sure to order 2 bulbs when you get into the shopping cart! 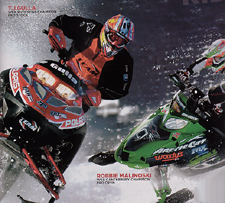 In the mid 90's, both Arctic Cat and Polaris started to use a three bulb configuration on many of their sleds. Acrtic Cat is the only one that currently offers the three headlight chassis (ZR III) in the big guns like the M1 and ZR 900. These are easy to tell because of the central mounted wrap around headlight just under the windshield. Both companies operated their headlights the same way, Lo-beam was the center single bulb, and the Hi-beam was the outer two bulbs. Stock configurations only give 1 or 2 bulbs at any time- never all three. 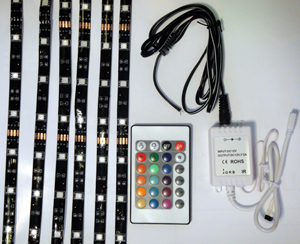 Our choices for your sled is very good and we have Brite Lites and Laser Lite Brite Lites in all colors and wattages. For the Acrtic Cat ZR II & III chassis, you are looking for a straight base 885 for the Lo-beam, and a pair of 894 right angle bulbs for the Hi-beam. Our Xenon Gas Laser Lites will fix you right up. For the Polaris Evolved or Gen II chassis, you are looking for a H4 Brite Lite Lo-beam and a pair of Laser Lites for the Hi-beam. we have attempted to simplify the process by making a "KIT" for you. The "KIT" includes all three bulbs for the price, you select the color of the Lo- & Hi-beams. If you have a mid 90's machine, of any brand, we have a Brite Lite that will fit and improve your vision. All Ski Doo S & F chassis; all Polaris Indy (wedge hood) and Lite; all Yamaha before 2000, and all Arctic Cat non ZR chassis (Prowler, Wildcat, Lynx). Basically any snowmobile with a single H4 headlight can be upgraded from the list below. Notes: If you have a EFI or Yamaha, the largest bulb you should use is a 100/55 watt(X-bulb), if you use a heated face shield on one of these EFI machines, use only a 60/55 Xenon Gas Brite Lite. If you have a mid 90's ZR I chassis (like ZRT 600), you need to verify the stock bulb as many came with a 9004 automotive bulb. It is a plastic base bulb, the last one in the list. We have several of "other" items to customize your sled and make it a one-of-a-kind machine. 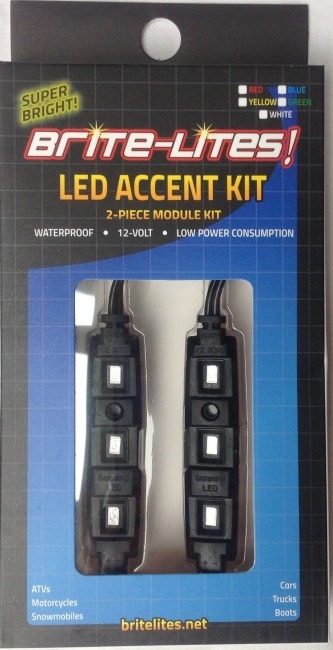 Take a look at our custom LED Accent Light kits, Remote Control LED Color changing LED kits, LED taillights, Headlight Caps, and Rainbow Strobe. For you Polaris guys with the Edge or Indy chassis, don't forget about our very first product that got us in the market back in 1992, the RAD Covers. 360 degree LEDs are the biggest thing going. We have the 360 degree LED for any snowmobile and for everything else (see Trailer LEDs for full line) We also have our legendary Pulsating and Rotating LED for the Yamaha folks- take a look! 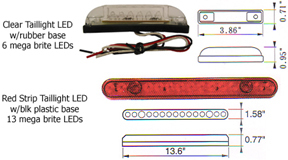 We have the extra long 360 LED for snowmobile taillights with extra room for a longer - brighter light. Ski Doo, Arctic Cat, Yamaha & Polaris models.